Winter is almost over, so I figured it'd be high time to post about this classic lipstick I've had in my collection for a couple months now; it's Revlon Cherries in the Snow! In the blogosphere, Cherries in the Snow seems to be well loved by nearly all beauty addicts, and I can definitely see why; the cool pinked cherry can look flattering on all skintones, and the formula is just dreamy: smooth, creamy and surprisingly long lasting - in fact, it outlasts my Chanel and YSL lipsticks! It might appear a bit overwhelming straight out of the tube, but as with most bold and pigmented lipsticks, it can be worked into the lips for a light stain which is not nearly as intense as opaque application. I quite like that the tube has a clear top through which you can see the shade (that's especially important if you store your lipsticks upright in a drawer - I don't, but I can still appreciate the design...), and that the bottom sticker matches the color of the lipstick and clearly states the name of the shade AND the finish. So smart, yet so simple! 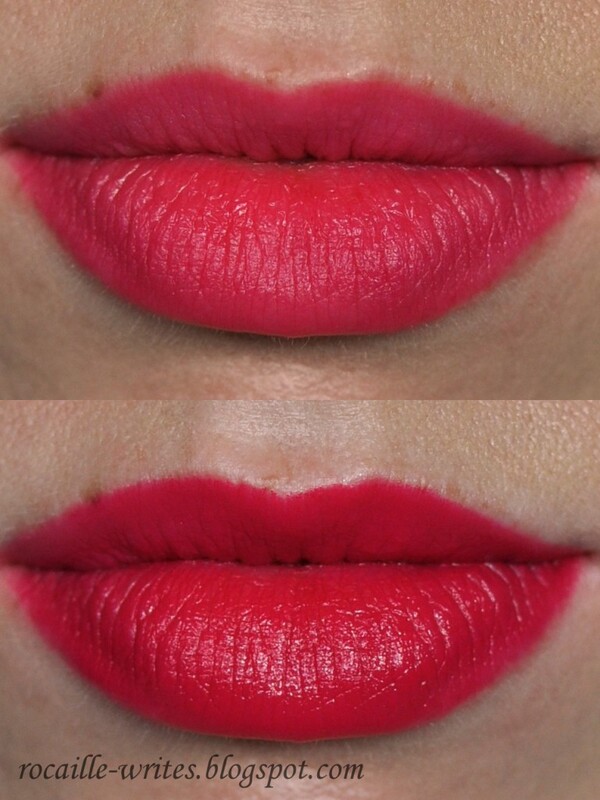 As always here, the sheer stain lip swatch on bare lips is on the top, opaque application on the bottom - straight out of the bullet, no lip liner. I decided to also show a more toothy swatch - see how white it makes my teeth look? That's make-up magic in action right there for ya. And this is a full face shot in natural daylight. I think I took the photos maybe 3-4 hours from the time of application, so it's a bit faded; impressive how evenly it wore, right? All in all, I do recommend this shade and formula a lot; the price-quality-availability ratio is hard to beat in this case. Have you tried Revlon Cherries in the Snow? What is your favorite Revlon lipstick shade and formula? So you DO have teeth! :P Kidding, kidding - the joke absolutely had to be made, though. Had to! Pink looks so pretty on you! This is the perfect shade - and that is really impressive that you took this photo hours after applying - it looks freshly applied! I had lunch just after taking that photo and it was STILL definitely there when I finished, and that never happens! Ok, going to buy this lipstick soon in that case :). And I agree with someone who commented below - love the necklace and the flicked eyeliner - I can never flick my eyeliner well. Do you have a post on that? Aww this color was made for you, you're absolutely lovely!! I blame you for making me wear a lipstick so completely unsuited to today's outfit, if that's alright with you. I saw this post and immediately dug out Cherries in the Snow despite wearing a peach-coloured top and blush and none of it goes but I don't care as I'm happy. So there! I love, love, love Revlon lipsticks (and really, almost all of their lip products). I just wish they would update the packaging for this line. I like the clear top, but the gold and black looks dated, and not in a cute, retro way. I quite like the simplicity, but I agree, it could be much cutter. Do you like the packaging on the Colorburst line? Yes, definitely. It's still simple, but in a modern way. Ok, so many things I love about your face (that sounds creepy)... Your skin is gorgeous, your eyes are so pretty & doe-like (and that flick! Guuuurl...), and Cherries in the Snow looks absolutely beautiful on you! YOUR EYES ARE SO PRETTY. WHY??? I like this color on you! I have a Revlon Super Lustrous (Fire & Ice?) and I...don't like it. Too creamy! Great review! I can't believe it looked like that after 3-4 hrs and after lunch too? Impressive for a drugstore lipstick. I was wondering, what camera do you use? Your pictures are superb! I've been on the fence about this lipstick for ages, which is bizarre given the fact that I impulse buy things far more expensive. I think I was nervous that it would be too pearly/frosty? It looks absolutely lovely on you and I think I'll definitely be picking one up this weekend.